[While hunting for Aida Parker stuff I came across this fascinating front page of her newsletter. I can’t tell in which year she published this. But seeing this front page of her newsletter, brings back something I’ve been pondering in recent months. In the early 1980s when I was in South Africa and when I was already very concerned that South Africa would share the same fate as Rhodesia, I began hunting for sources of information. In those days before the internet people ran private newsletters and I found some in the USA and subscribed to them. One newsletter that I did not subscribe to for long, and which left me with a weird impression, was one called something like: The La Rouche Report. I think the name was La Rouche. Now this “anti-communist” newsletter spoke about the Elite as I recall and of course, nothing mentions THE JEWS! 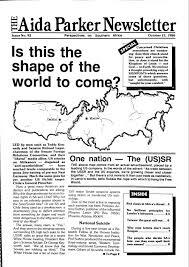 But what was weird about this newsletter with seemingly good sources, was that it spoke about the idea that “the Elite” (whoever they were), were in with communism and wanted to bring communism to the USA and to merge the USA and the USSR. I found the notion really weird and I could not grasp why a “white elite” would (a) be in with communism (b) want to merge the USA with the USSR. That was of course because I had no knowledge of the Jew and the Jew’s MASSIVE ROLE in the creation of communism and the resultant incredibly bloody revolution in the Russia in 1917. I did not realise the power of the JEWS in the USSR! So none of this made sense to me. But now, decades later, looking back, and being fully aware of the Jews and their massive power in the creation of this beast called the USSR and in building it up, thanks to the dumb English-speaking white fools in the UK+USA and the rest of us dumb white fools outside Europe who agreed that it was a great idea teaming up with Soviet Communism to fight the good guys, the Germans, Italians and others who were asserting their rights to ruling themselves (for once). Now when I look back on this idea of the USA and USSR merging, it makes a lot more sense. It makes sense to create a “communist super-state” composed of the USA and USSR which could then dominate the world forever and make it wonderful for the Jews and living hell for everyone else! The MASS of Jewry, left Europe and went to the USA where the biggest population of Jews in the world now lives. Since the Jews have massive power in the USA and their largest numbers there, it would make sense that they would want to team up with the Soviet Union, their favourite communist project and see if they could merge 2 very different nations. But while this may seem nonsensical to Americans and Russians, it would suit the Jews perfectly since they have massive power in both states. So this made no sense to me in the 1980s but now I look back and I think that indeed this must have been one of the Jewish plans. Nowadays the Jews are obsessed with their next project Communist China – which we’ll return to. I have no idea what Aida Parker wrote on this topic. But to me, this notion which I first came across from the La Rouche people, now makes total sense. But I think the idea has failed. However, it may show some of the hideous thinking of the Jews in the 1970s and 1980s. I don’t know the origin of this idea. But its a fascinating one. Its one I’d like more information on if anyone has it. This is some of the creepy thinking of the Jewish filth we called The Elite. One other point: Europe does not feature in Jewish thinking and I think that’s because of Jewish hatred for Europe and that anything the Jews do is aimed at DESTROYING EUROPE because they HATE THE WHITES THERE, even the Christians. My Jewish friends expressed no love at all for Europe and the whites there, even for the Christians. They HATE ALL THE WHITE PEOPLE OF EUROPE. I came to realise that. That’s why all the Jewish projects for building hideous new political structures involve building up every part of the earth EXCEPT for Europe. The filthy little Jewess Barbara Spectre had the gumption to say that Europe would not survive into the future. To hell with her I say. We whites must see to it that Europe above all places survives and prospers and hits new levels of greatness that will make every other place look like a little African village. Europe must arise again and be the true super power that it is. It is our homeland. White Efficiency: Feudalism: Whites had 2-6 months of vacation every year during the Middle Ages! InfoWars’ Paul Watson spreads a lie about Hitler & Capitalism! – Hitler LOVED small businesses!